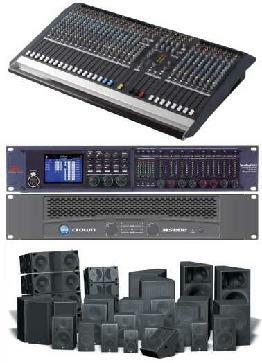 A sound reinforcement system is an arrangement of microphones,electronic signal processors, amplifiers, and loudspeakers that makes live or pre-recorded sounds, usually music or speech louder, or which distributes the sound to a larger or more distant audience. Newtech Systems can design a system for virtually any type of setting. Whether you have a small 100 square foot room or a 90,000 seat arena, we have the knowledge to design a system for you. We use Computer Enhanced Acoustic System Design to optimize the sound produced by your system. We enter all of the building dimensions, wall textures and sizes, then decide what the proper sound reinforcement system to use in that particular space. After the design stages, Newtech then assigns our factory trained installation technicians to install the system. When the installation is complete, the job is not quite done yet. We then bring in our design team once again. They will go through the facility using analyzing equipment to “fine tune” the system. Finally, you and your staff will be trained on proper operation of your system. We will sit in on the first use of the system giving you a secure feeling with your system. What ever your situation, Newtech Systems can help you design a system that will meet your needs and budget.